Please visit us on Facebook for current news and event information. Welcome to the Eclipse Crossroads of America! Scenic Southern Illinois hosted travelers and research groups from around the world to the region for the August 21, 2017 total solar eclipse, and we are gearing up to do it again on April 8, 2024 with the coming of the next total solar eclipse to the region. Information on upcoming Crossroads Eclipse 2024 Festivities as well as interim events will be released as it is availalble at eclipse.siu.edu. 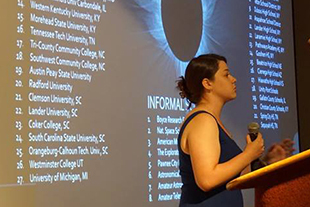 Individuals wishing to take part in planning for events and research related to the 2024 ecilpse should contact the SIU Eclipse 2017 -2024 committee co-chair, Bob Baer, rbaer@siu.edu. Hope to see you in 2024!